During 1908, the Austrian Empire celebrated the Diamond Jubilee, or 60th Anniversary, of the accession of Emperor Franz Josef I to the throne. To celebrate this historic event, a new series of large-format pictorial definitive postage stamps were issued, replacing the portrait definitives of 1899-1907. 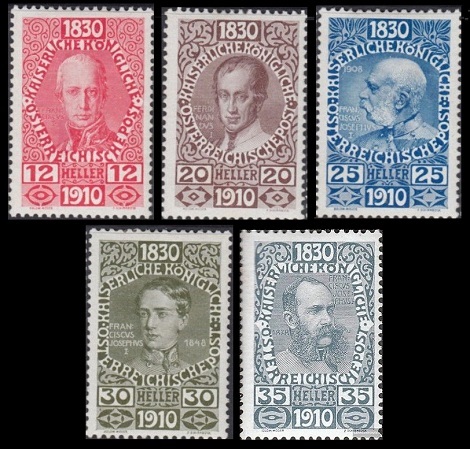 These new pictorial definitive stamps featured portraits of Hapsburg monarchs of the 18th and 19th Centuries, as well as various portraits of Emperor Franz Josef I.
Printings of these stamps continued through 1916, and over this period of time, several different types of paper were used. Though the set looks straight-forward and simple, specialization can offer a bit of a challenge to the Austrian philatelist. Most of these stamps are also known imperforate, and as such, they are not terribly expensive. 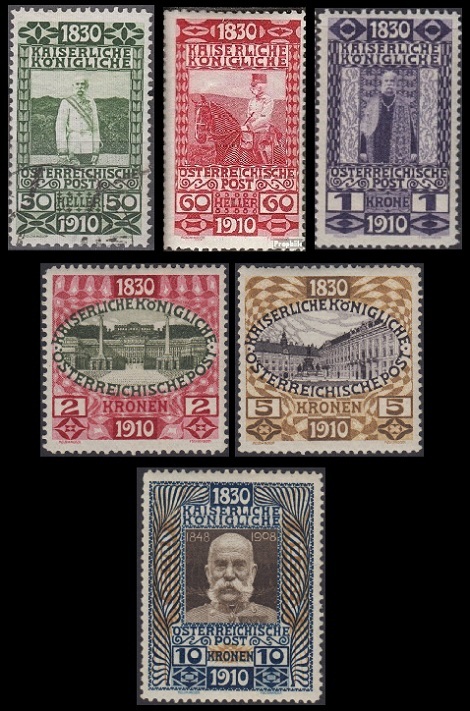 The eighteen large-format pictorial definitive Austrian Empire stamps shown above, with the exception of the 72 H. denomination, were issued on January 1, 1908. The 72 H. denomination stamp was issued during February 1913. The 01 H. through 35 H. denomination stamps are typographed, the 50 H. through 10 K. denomination stamps are engraved, and all of the stamps are perforated 12 1/2. The pictorial designs are as follows. 01 H. - Emperor Karl (Charles) VI (Lived: 1685-1740, Reigned: 1711-1740). 02 H. - Empress Maria Theresa (Lived: 1717-1780, Reigned: 1740-1780). 03 H. - Emperor Joseph II (Lived: 1741-1790, Regined: 1780-1790). 05 H. - Emperor Franz Josef I (Lived: 1830-1916, Reigned: 1848-1916) in 1908. 06 H. - Emperor Leopold II (Lived: 1747-1792, Reigned: 1790-1792). 10 H. - Emperor Franz Josef I (Lived: 1830-1916, Reigned: 1848-1916) in 1908. 12 H. - Emperor Francis I (Lived: 1768-1835, Reigned: 1804-1835). 20 H. - Emperor Ferdinand I (Lived: 1793-1875, Reigned: 1835-1848). 25 H. - Emperor Franz Josef I (Lived: 1830-1916, Reigned: 1848-1916) in 1908. 30 H. - Emperor Franz Josef I (Lived: 1830-1916, Reigned: 1848-1916) in 1848. 35 H. - Emperor Franz Josef I (Lived: 1830-1916, Reigned: 1848-1916) in 1878. 50 H. - Emperor Franz Josef I (Lived: 1830-1916, Reigned: 1848-1916) in Field Marshal's uniform. 60 H. - Emperor Franz Josef I (Lived: 1830-1916, Reigned: 1848-1916) on horseback. 72 H. - Emperor Franz Josef I (Lived: 1830-1916, Reigned: 1848-1916) in Field Marshal's uniform. 01 K. - Emperor Franz Josef I (Lived: 1830-1916, Reigned: 1848-1916) in royal robes. 02 K. - Schönbrunn Palace, Vienna. Begun originally as a hunting and recreational reserve in the 16th Century, this palace served as the summer residence of the Austrian royal family. Since the fall of the Hapsburg monarchy at the end of 1918, the palace has been maintained as a national museum. 05 K. - Hofburg, Vienna. Begun originally in the 13th Century, this Baroque palace has served as the seat-of-government of the Hapsburg Dynasty and as the winter residence of the Austrian royal family. Today, it is the official residence of the President of Austria. The Austrian Crown Jewels are also kept there. 10 K. - Emperor Franz Josef I (Lived: 1830-1916, Reigned: 1848-1916) in 1908. There are three noteworthy errors, which are actually relatively common and not unreasonably expensive. They are as follows. 10 H. - "1903" instead of "1908". 25 H. - "PRANCISCUS" instead of "FRANCISCUS". 35 H. - "ERANCISCUS" instead of "FRANSISCUS". 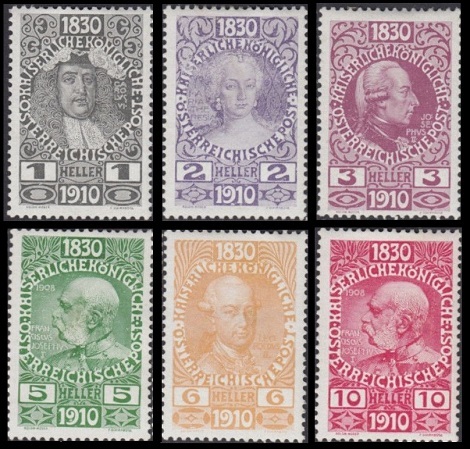 The Michel / Scott catalog attributes, for Austrian Empire stamps that are printed on chalk-coated paper (01 H. - 35 H.) or on white to yellowish wove paper (50 H. - 10 Kr. ), are as follows. The color names used are from the Michel catalog. 01 H. (1908 - Mi. #139v, Sc. #110a) - Olive Black. 02 H. (1908 - Mi. #140v, Sc. #111a) - Dark Bluish Violet. 03 H. (1908 - Mi. #141v, Sc. #112a) - Dark Gray Lilac. 05 H. (1908 - Mi. #142v, Sc. #113b) - Green. 06 H. (1908 - Mi. #143v, Sc. #114a) - Dark Yellow Orange. 10 H. (1908 - Mi. #144v, Sc. #115b) - Dark Rose Carmine. 12 H. (1908 - Mi. #145v, Sc. #116a) - Red. 20 H. (1908 - Mi. #146v, Sc. #117a) - Dark Reddish Brown. 25 H. (1908 - Mi. #147v, Sc. #118a) - Violet Ultramarine. 30 H. (1908 - Mi. #148v, Sc. #119a) - Dark Gray Olive. 35 H. (1908 - Mi. #149v, Sc. #120a) - Dark Prussian Blue. 50 H. (1908 - Mi. #150w, Sc. #121) - Dark Green Olive. 60 H. (1908 - Mi. #151w, Sc. #122) - Medium Carmine Red. 72 H. (1913 - Mi. #152w, Sc. #123) - Dark Red Brown. 01 K. (1908 - Mi. #153w, Sc. #124) - Dark Blue Violet. 02 K. (1908 - Mi. #154w, Sc. #125) - Dark Carmine Red & Dark Ollive. 05 K. (1908 - Mi. #155w, Sc. #126) - Dark Ocher Brown & Dark Violet. 10 K. (1908 - Mi. #156w, Sc. #127) - Multicolored. 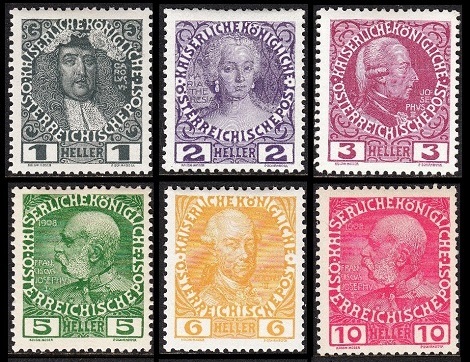 The Michel / Scott catalog attributes, for Austrian Empire stamps that are printed on white to yellowish wove paper (not chalk coated), are as follows. 01 H. (1908 - Mi. #139x, Sc. #110) - Olive Black. 02 H. (1908 - Mi. #140x, Sc. #111) - Dark Bluish Violet. 03 H. (1908 - Mi. #141x, Sc. #112) - Dark Gray Lilac. 05 H. (1908 - Mi. #142x, Sc. #113) - Green. 06 H. (1908 - Mi. #143x, Sc. #114) - Dark Yellow Orange. 10 H. (1908 - Mi. #144x, Sc. #115) - Dark Rose Carmine. 12 H. (1908 - Mi. #145x, Sc. #116) - Red. 20 H. (1908 - Mi. #146x, Sc. #117) - Dark Reddish Brown. 25 H. (1908 - Mi. #147x, Sc. #118) - Violet Ultramarine. 30 H. (1908 - Mi. #148x, Sc. #119) - Dark Gray Olive. 35 H. (1908 - Mi. #149x, Sc. #120) - Dark Prussian Blue. The Michel / Scott catalog attributes, for Austrian Empire stamps that are printed on grayish wove paper (wartime printing), are as follows. 60 H. (1916 - Mi. #151z, Sc. #122c) - Medium Carmine Red. 72 H. (1916 - Mi. #152z, Sc. #123a) - Dark Red Brown. 01 K. (1916 - Mi. #153z, Sc. #124c) - Dark Blue Violet. 02 K. (1916 - Mi. #154z, Sc. #125a) - Dark Carmine Red & Dark Ollive. 05 K. (1916 - Mi. #155z, Sc. #126a) - Dark Ocher Brown & Dark Violet. 10 K. (1916 - Mi. #156z, Sc. N/L) - Multicolored. 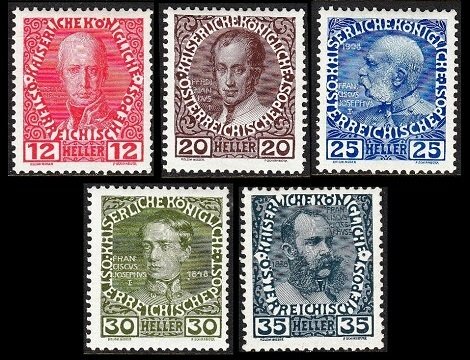 The seventeen commemorative Austrian Empire stamps shown above (Mi. #161-177, Sc. 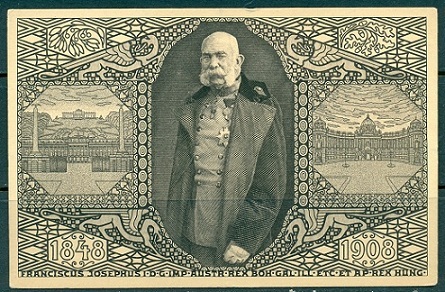 #128-144) were issued on August 18, 1910 to celebrate the 80th Birthday of Emperor Franz Josef I. The designs are identical to those of the pictorial definitive stamps of 1908, with the exception that additional tablets have been added to the top and bottom of each design, containing the year dates "1830" and "1910". 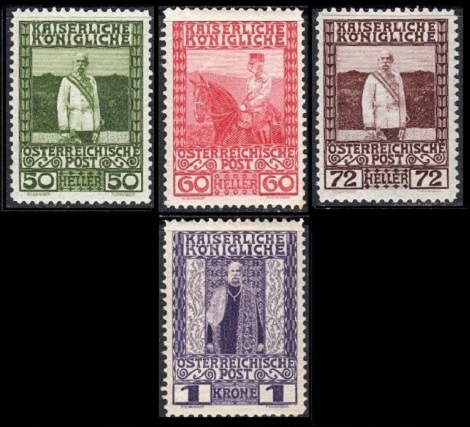 Imperforate examples of these Austrian Empire stamps exist. Proofs, on various papers and in various colors, also exist. 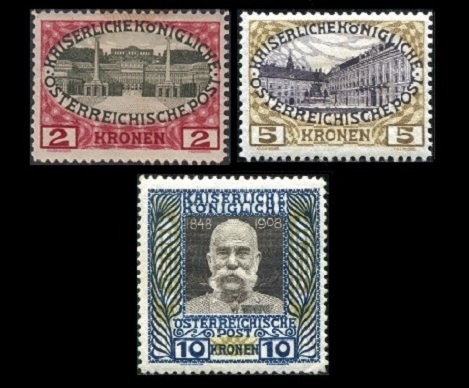 The four major-type Austrian Empire newspaper stamps shown above were issued between 1908 and 1910. These stamps were printed on various papers, and they are all imperforate. They also exist with private perforations of various types. During 1908, these stamps were printed on chalk-coated paper (Mi. #157x-160x, Sc. #P15-P18). During 1909, these stamps were printed on thin, glossy, translucent paper (Mi. #157y-160y, Sc. #P15-P18). During 1910, these stamps were printed on ordinary, thicker, smooth paper (Mi. #157z-160z, Sc. #P15-P18). The common design features a modernistic, right-facing profile of Mercury.